Decades ago, probably in the early 1970's, I bought an inexpensive set of Sennheiser headphones. Model HD 400. They turned out to be the best set of 'phones I've owned, of either open air or earcup style. 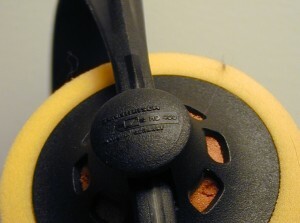 The yellow foam pads lasted a long time, but they eventually needed replacing. In October of 1995 I bought direct from Sennheiser a pair of ear cushions, their part # then was 19544, their item called HD400-03. They cost $3.40 for the pair and they charged $3.00 for shipping. 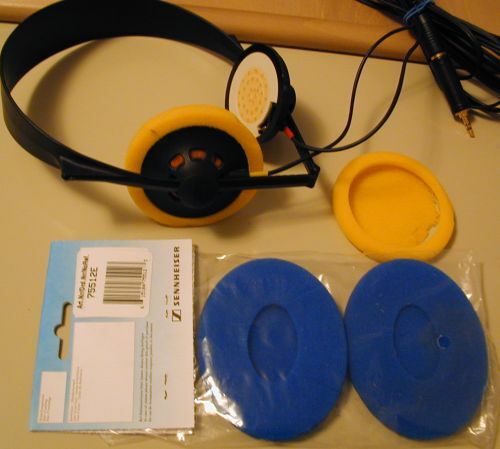 Now I again need to replace the pads, and contacted Sennheiser. By this time however they discontinued this particular part number and I had a heck of a time figuring out just which part I needed to order. At their suggestion I bought part number H-75512. Upon their arrival on December 15 I immediately knew there was a problem. My letter to them below explains. This page shows the shipment of replacement ear cushions I received today, 12/15/03, for my old (but still fabulous) pair of HD 400 headphones. I have some pictures to show the originals and the replacements I just received. Actually, these yellow cushions are replacements from 1995, though are identical in every way to the originals. I think I bought the headphones around the mid 1970's though maybe you can give me some detail on dates they were manufactured. The replacements in today's shipment, the blue cushions seen below, came on invoice # 568167, dated 12/10/03, order # 22619, item # H-75512. I fear something is quite amiss! They aren't the right size nor shape. My HD 400 set is old, your earcushions are for the new HD 400 Headmax. The question becomes, are the yellow replacement cushions available (the color not withstanding)? The part number I bought from your company as replacements on October 3, 1995, was 19544, ear cushion, the item # was HD 400-03. This was your order # 34312, invoice date 10/4/95, invoice # 138513. This is probably too old of information for you to still have records. Thanks for your help on resolving this issue. You can email me at hislands @omca t.net. Please refer to my email dated 12/15/03. And if you would like any more pictures I can send them, in whatever detail desired. Thanks. Fortunately, they did have a replacement for the HD 400. Their part number now is 33175, as it appears on the package. On the Packing Slip the pt# is S33175, and is described HMD/HME,HD.CUSHION,GRA. 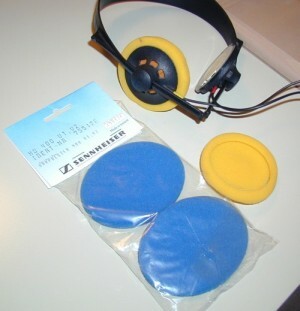 (The package label states "Ohrpolster Earpad HMD 410/HME 410/HME 1410/HD410"). They aren't yellow anymore, they are a very dark gray, they look black. But they are the correct size and shape. This time I bought 2 pair, at the "high" price of $9.38 including shipping and handling. So we are back to normal and happy with the outcome. My conversations and emails with the company were very cordial, and they helped me out splendidly. A very satisfactory outcome. If you need to order cushions for this model headphone, email Sennheiser at <WebMail@sennheiserusa.com> .